It is the perfect material to turn patios, pet areas, swimming pools, dining rooms, terraces and entertainment spaces into beautiful and cozy areas for the family members and their guests to enjoy. Synthetic grass is made from artificial fibers similar to natural grass leaves, but it has a long list of advantages such as its resistance to insects and fungi. As a complement, artificial lawns lower maintenance costs significantly. Once installed, they do not need fertilization, weeding or trimming in the winter, nor irrigation during the dry season. While creating a perfect landscape is necessary to take into account certain requirements to avoid wasting time and money but these aspects should be taken into account by the company selected for the installation of the artificial grass in your home or business. At Better Than Real Artificial Grass we work with the highest quality products manufactured in the United States. The attention we put in the quality and the rigorous installation work of the grass allows us to guarantee our products for ten years. We offer the option for a perfect landscape for your home or business in San Jose, CA. 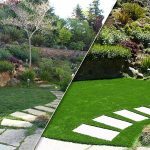 We are located in the North Bay Area and South Bay Area of ​​California but we offer our services of sale and installation of synthetic grass in cities like Santa Rosa, Petaluma, Novato, Napa, Sonoma, San Francisco, Oakland, Berkeley, San Mateo, Redwood City, Palo Alto, San Jose, Los Gatos and others. Contact us now! We’ll advise you and give you a free quotation!